Inch, once truly an island as its name suggests, was the site of a pre-Norman monastery known by the island's earlier name of Inis-Cumhscraigh (pronounced 'Inish Cooshcree'). Its foundation date is unknown, but it was in existence by 800 A.D. Inch was devastated by a Viking raid, led by Sitric Silkbeard, in 1001 when many captives were taken. It was raided again in 1149 by the Irish, which suggests that the church was wealthy enough to be worth raiding. The earlier monastery was probably sited in the area of the parish graveyard, north of the present ruins and a chapel existed there in the Middle Ages, at the edge of the medieval monastic precinct. The visible ruins are the extensive remains of the Cistercian Abbey. The Cistercian order was founded in late 11th century France to pursue a strict communal life of worship, study and manual work. The Cistercian Rule insisted that Monasteries should be sited far from the distractions of everyday affairs, and in its beautiful riverside situation Inch perfectly illustrates this preference for solitude. 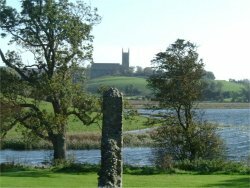 The Abbey was founded by John de Courcy, conqueror of Ulster, in 1180, after he had burned its predecessor, Inis-Cumhscraigh. De Courcy was a strong supporter of the church. 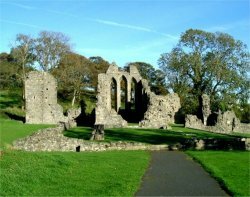 His wife Affreca, daughter of Godred, King of Man founded Grey Abbey in 1193, also Cistercian, and is buried there. Inch was established by monks from Furness in Lancashire, its 'mother house', and was almost certainly partly built by masons brought in by de Courcy from England. Little is known of the abbey's later history except that it remained a centre of strong English influence, refusing to accept Irishmen into the community. The architectural evidence suggests that its numbers contracted in the later Middle Ages, and monastic life ended with the dissolution of the monasteries when, in 1541, it was granted, with its lands, to Gerald, Earl of Kildare. By the late 19th century the buildings were badly ruined and overgrown, but excavation and repairs were carried out in 1914 when many of the architectural details were restored in cement.